Use the linked tutorials below to make miniature dolls and figures in several scales using basic sculpting techniques and polymer clay, epoxy putty or air dry clay. The dolls can be made fixed or poseable, making them useful for all kinds of miniature, dollhouse and gaming applications. If you want a new character for a dolls house or a war game, the techniques are the same, but the scale and materials may be different. The figures are sculpted with a wire armature, and information is given on how to make separate hands, feet, torsos and heads so you can make solid posed figures or poseable dollhouse dolls. Compare the head of the 1:12 scale teen doll to the head of the 1:12 scale senior character doll. Photo ©2008 Lesley Shepherd, Licensed to About.com Inc. The linked tutorial on body proportions will show you how to make your figures look correctly sized. Figure proportions are important when you sculpt dolls and other miniature figures as they will help determine the age and character of your doll or figure. The average person is measured by artists and sculptors based on the proportions of the head. All parts of the body, even the arms, legs, and feet can be related to the size of the head as a comparison to make sculpture easier. You can adapt the age and appearance of your figure by giving them a larger or smaller head than normal for their height. Babies have heads proportionately larger than the heads of adults, and you can create interesting caricatures by adjusting the size and proportion of the head in relation to the size of the rest of the body. If you want dolls that are not all the same height and age range, you need to study proportion. Figures that are different sizes, and proportioned according to age, will lend your scenes, or games much more interest than figures which are all exactly the same height as those cast from molds usually are. Adding a neck and smoothing out the final features on a miniature doll's head sculpture. Photo ©2008 Lesley Shepherd, Licensed to About.com Inc.
Use this tutorial to learn how to sculpt miniature heads. The head is the place to start learning to customize dollhouse dolls and other miniature figures. Once you can make a basic head, you can create entire families, make characters of particular ages, or caricature your friends. Sculpting a head is much easier than you think. All the parts of the head fall in regular spaces, and if you adjust those, you will adjust the appearance of your character. There are some slight differences made much easier by particular materials. If you like making heads with soft or 'plump' facial features, polymer clays which are highly elastic will work well. If you prefer to sculpt in slow built up stages, you may prefer working with two-part epoxy putties. 1:12 scale miniature doll hands sculpted from polymer clay hold a dolls house book. Photo ©2008 Lesley Shepherd, Licensed to About.com Inc. Hands can add expression to a doll or figure pose or hold props for a scene. If you can make miniature hands, you can avoid trying to rebuild plastic and resin cast figures to make them more lifelike. Hands require good attention to proportions and pose, and tools that will allow you to work with very fine details on your chosen material. If you create various sets of hands in your working scale, you can make casts of the hands to easily create suitable hands for a range of characters, without beginning each sculpture from scratch. Roughly shaping the torso of a doll's house doll to form a chest and shoulder area from polymer clay. Photo ©2008 Lesley Shepherd, Licensed to About.com Inc. Sometimes you need more than a head on a stick. Sculpting miniature doll or figure torsos lets you set heads on different poses, show off jewelry, armor or clothing details. The torsos can be sculpted to show upper arms as well as the chest. 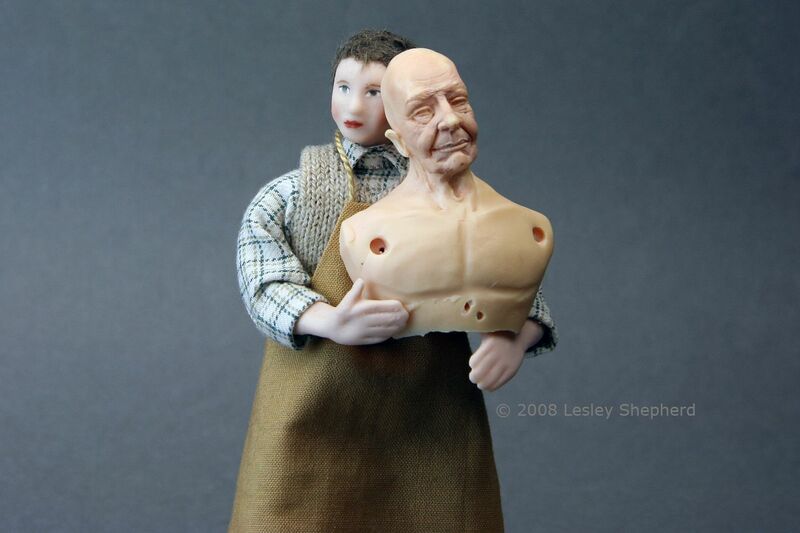 For poseable dolls and figures, you may want to limit the amount of the torso that is made from polymer clay or epoxy putty, in order to allow for a dressed body which can be bent and twisted into realistic poses. A pair of bare feet made from polymer clay for a doll's house doll. Photo ©2008 Lesley Shepherd, Licensed to About.com Inc.
You may need a leg, a shapely ankle, or a roughened barefoot for a particular miniature scene. This tutorial shows you how to sculpt miniature feet. Feet are easier to sculpt than miniature hands, and if you don't like the idea of trying to sculpt tiny toes, just sculpt a shoe on the bottom of a leg. This doll's body has been wrapped with cotton batting. The arm on the right of the photo is finished, the arm on the left of the photo has had one layer applied and needs a final layer. Photo ©2008 Lesley Shepherd, Licensed to About.com Inc. This tutorial shows three easy ways to pad the armature on a miniature doll. If you can make a head and hands you can create the rest of a full figure or doll by padding out a body over a wire armature. The same techniques work for creating a padded body with traditional porcelain doll parts. Wig Your Doll House Dolls. How to wig your dollhouse doll has Information on wig fibers, wig caps, wig blocks and where to find online or in print wig making tutorials. You can give doll's and figures hair with a range of different fibers, from embroidery floss through to mohair, Tibetan lambs wool, and viscose. Wigging figures is not particularly difficult, but you need to decide if you want one fixed hairstyle on a doll or the option of changing out hairstyles by using removable wigs. This poseable teen age garden assistant in dolls house scale is made of porcelain by Little Women in the UK. Photo ©2008 Lesley Shepherd, Licensed to About.com Inc.
Miniature dolls or dollhouse dolls are constructed of many materials and assembled in many different ways, making it difficult to choose between them. The majority of dolls are chosen for their costume and pose not their features. Here are some suggestions about how to choose a doll that suits your needs for particular scenes or styles. This list of doll making tips has links to lots of information to help you sculpt the figure you want. Dolls are as individual as the dollmakers who create them, and the range of tips may help you find a technique that works best for you and your style of doll making or doll.